Are you looking for something fun to do with the kids to celebrate Dr. Seuss birthday—and national Read Across America day today? 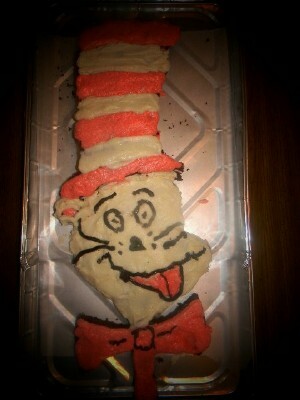 The girls and I chose to make a Cat in the Hat shaped cake as our first themed activity this year. Later, we’ll be reading some Dr. Seuss books and creating a collage of things that we would imagine on Mulberry Street. Obviously, the Thompson house does not home a cake decorator—but, the purpose of this cake was to use our imaginations (and no cake pan!) to create our own cake design. Want to make a Cat in the Hat shaped cake of your own? We are including our somewhat “primitive” instructions! It makes a lot of cake—luckily the girls have activities and events planned for the next few days to use it all! You can certainly size down the patterns to create the image on a 9x13 inch cake. 2 Cans of Frosting—or your favorite frosting recipe. We used a basic buttercream frosting recipe. Bake and Cool the Cakes. Bake the cakes according to recipe or package instructions, remove from pans and allow to cool completely. Cut Shapes from Cooled Cakes. Position paper templates over cakes and cut around patterns with a sharp knife, removing excess scraps and dusting away crumbs. Prepare Frosting. Divide frosting into two bowls—reserving ½ c. if you will be “coloring” it brown with chocolate! Add red food coloring to one bowl of frosting and mix thoroughly until desired color is reached. Assemble the Cake. Carefully assemble your cut out pieces to create your Cat in the Hat on a board or pan for frosting. Frost and Decorate as Desired. We used our “scrap” cake to make shapes and fish—the girls had a lot of fun making (and eating) their mini-cake creations!